"As many of you know we've been living in a trailer for almost a year while our house is under construction. Well, except for the 87 days in a hotel. I've taken over our dinette and my parents house with my stuff. The only way I keep sane in both work spaces is a lot of store bags. I've organized all of my notions, fabrics, stuffing, etc. into numerous bags. I hope my future Workspace Wednesdays will show my new studio which used to be our old bedroom. felt stuffed designs are sewn by hand. I hope they are a hit with the kids! 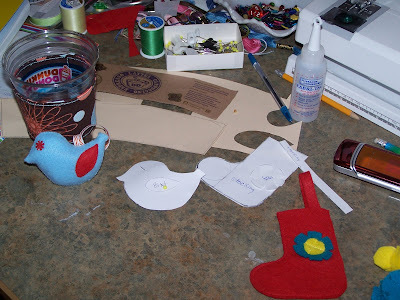 Family and friends will be getting a set of my felt stuffed bird ornaments. Some of you know them from our first show at Jessica's studio. I made them for our goodie bags and I know a few of you scored them for yourselves. Also for my close friends I'm making coffee cozies along with a gift certificate from Dunkin's. I used some left over heavy weight fabric in a chocolate brown with cool colors of different sized dots and the other fabric has spirograph shapes. The colors remind me of coffee. I had a left over cup and a cardboard sleeve that Dunkins/Starbucks gives you and I got my pattern from that. I added some velcro and you got yourself a stylish reversible coffee cozy." Beth you always make the most creative things!!!! I admire all your work!